I hate to make sweeping generalizations about my own oft-mocked generation, but Millennials love our nostalgia. Pretty much anything with a remember-the-90s theme is going to go gangbusters on the Interwebs, and there’s a reason we obsessively document our lives – so we can squeal about them later when we look at old pictures. Thus, it’s only logical that Throwback Thursday (or #tbt as you and I know and love it) is such a big freaking deal. Do you post a comically angelic baby picture every Thursday? Or an immaculately-lit snapshot from that one week three years ago when you did the Atkins diet and became your sveltest self? If you use Instagram or Twitter, you’ve probably seen or used the hashtag #throwbackthursday, or #tbt, once or twice (or a million times). It rose to such infamy that along came #flashbackfriday so people would have an excuse to post old pictures two days a week instead of one. It’s so popular that there are over 40 million pictures tagged with #tbt on Instagram, another nearly 23 million with #throwbackthursday and there are even over 135,000 hilariously tagged with #throwbackthursdayy. 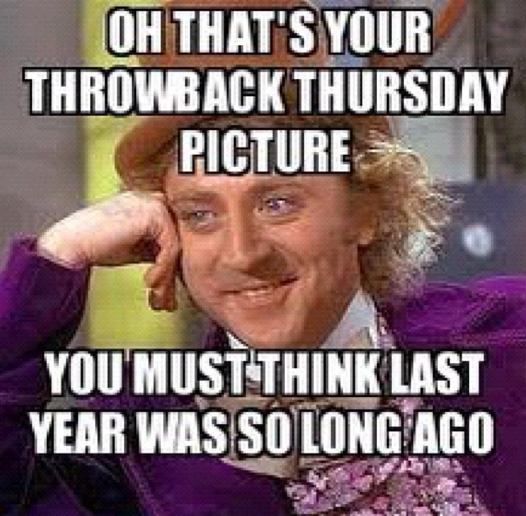 Throwback Thursday is possibly the most popular hashtag game ever. But that doesn’t mean everyone knows how to do it properly, or when it started. It’s hard to pinpoint exactly where Throwback Thursday started. If you do a search using the Instagramers iPhone app that lets you easily pull up the oldest tags on file, you see that a user named @bobbysanders22 is the first person on record as using the tag, in 2011, not long after Instagram added hashtags as a feature. However, Instagramers founder Philippe Gonzalez tells us that’s no indication that the user started the hashtag. “We are never 100 percent sure, as Instagram is removing old tags these last months and some old ones could have been deleted.” Instagramers included Flashback Friday as one of its recommended hashtag games when the feature was first introduced in January 2011. 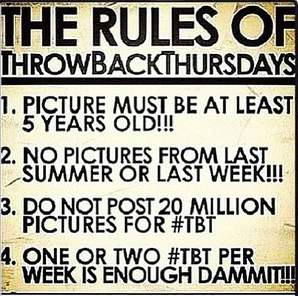 So pinpointing the true first #tbt post is tricky. Looking at Google Trends, though, it seems people started looking up Throwback Thursday more regularly in February 2012, and since then, interest in the hashtag game has increased substantially. Unfortunately, there’s no way to search for the earliest time it was used specifically on Twitter, though if you look at frequent #tbt advocates like the Kardashian sisters, their first recorded use of the term on Twitter for Kim is February 2012. So it’s safe to say that the idea of Throwback Thursday got started in 2011, gained traction throughout 2012, and is now safely ensconced in 2013 social media habits. Now that we’ve explained #tbt’s origins, let’s get down to business. Technically you can put a picture of anything on social media and tag it with #throwbackthursday (or #tbt, you get it), because you are given that freedom. But just because you can do something doesn’t mean you should. That’s why nobody’s remade Battlefield Earth. And if you keep posting selfies from 12 hours ago and adorning them with the #tbt hashtag, people are going to call you out. The art of Throwback Thursday is selecting an appropriately nostalgia-inducing picture – from a different era of your life. And last Tuesday doesn’t count, even if since then you’ve gotten a new tattoo and bought a pet lizard named Rascal. Bonus points if you get topical. Is it October? Throw up a photo of that embarrassing middle school Peter Pan costume. Prom season? You know what to do. If you want to post a picture from the more recent past, the tag #latergram is more appropriate to showcase pictures from last week you just can’t resist posting again – keep the throwback tag special for pictures that could have at least been archived on Facebook, if not capable of actually gathering dust. Now that Instagram lets you tag users, you can make Thowback Thursday more communal by tagging your friends in old pictures you post – though you may be more popular if you limit this to tagging them in cute baby or high school pictures instead of highlights from your notorious Cancun trip in 2009. And even though you might have an endless store of old photos of you doing charming baby things or looking sassy as a middle-schooler or bragging about the adorable puppy you had as a kid, exercise some restraint and limit yourself to one or two pictures each Throwback Thursday. After all, the beautiful thing about this hashtag game is that it happens every damn week. It’s not a Leap Year situation where you’re waiting ages for it to come around again. Throwback Thursday isn’t rare like those 17-year-old cicadas supposedly invading the East Coast. It’s common, and it’s everywhere, like basement centipedes. And like basement centipedes, one or two is tolerable, but a constant onslaught is enough to make somebody scream. If you’ve decided to use this Thursday to upload every soccer team picture you took over a 10-year span, reconsider. Since Throwback Thursday is so popular, it’s starting to spawn business ideas. 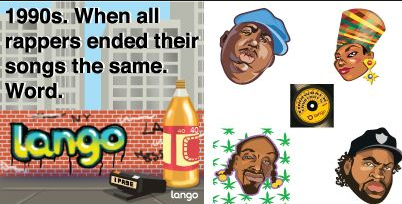 For instance, the messaging startup Lango, an app that lets you send animations to your friends, introduced a packet of animations based on Throwback Thursday, and they’re an interesting way to spice up your nostalgia-tinged pictures. They come out with new Throwback packages each week, so when I checked it out there was an adorable drawing of Jennifer Aniston’s head circa-Friends, while another pack in May includes 90’s rap-themed animations like Snoop Dogg and Biggie. The only drawback: to use Lango messaging you need to have a friend with the app as well, so it doesn’t work like emoji where you can put the animations in an SMS. But Lango’s VP of Mobile Jen Grenz explains that you will be able to put them in Instagram soon. “Not quite yet Instagram, though it will be a matter of weeks. We do allow you to post to Facebook and Twitter,” she notes. So that’s one way to give your Throwback pictures some added flair. Now that we have the ability to access an archive of our tweets, we could also start sharing those (this has a high embarrassment factor, but they, that’s part of the game). Really, what I’m trying to say is the future of celebrating Throwback Thursday’s wonderful nostalgia is in our hands, Internet. What should we do next?